This issue of AEMS News and Reviews covers three documentary films on the interactions of art, politics, history and people's daily lives in Turkey, Cambodia, and Philippines. The Play documents how women living in a village in southern Turkey express themselves through creating and staging their own theatrical play. In this play, the women enact their own life stories, giving voice to how individual experiences influenced their daily lives, families, and communities. Don't Think I've Forgotten explores the history, politics and the contemporary traces of how Cambodian musicians incorporated Western rock and roll music styles with Cambodian traditional music during 1960s and 70s, a period after Cambodia gained independence from French colonial rule in 1953. Jeepney visualizes the richly diverse cultural heritage of the Philippines through its boldly decorated and ultimately iconic mass transport vehicle. As always, we extend thanks to the scholars who review the documentaries and provide invaluable suggestions on the pedagogical use of the documentaries. The next issue of AEMS News and Reviews will feature three documentaries on gender issues and social change in China and Japan. We appreciate your continued interest in News and Reviews, and we welcome your suggestions and feedback. Directed by John Pirozzi. Produced by Andrew Pope. 2015. Cambodia. 106 minutes. The brutal legacies of Pol Pot and the Khmer Rouge loom large in Cambodian history and in most books and films about the country. In this sense, Don't Think I've Forgotten may feel familiar to viewers acquainted with media portrayals of recent Khmer history. However, what makes this film unique - and uniquely powerful - is its detailed account of the richness and vitality of the culture that was all but destroyed by the Khmer Rouge. After gaining independence from French colonial rule in 1953, King Norodom Sihanouk aimed to keep Cambodia neutral even as war and conflict spread in neighboring Vietnam and Laos. An avid music lover and performer, the French-educated King Sihanouk encouraged the development of a vibrant culture and music scene in the country. It is this music scene, which retained a distinctly Khmer flavor despite the strong influence of French and American music and which functioned as a site of both joy and despair, on which the film focuses. 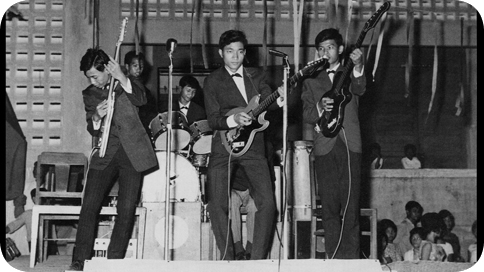 Through the extensive use of historical photos and music video clips, as well as contemporary interviews with musicians, the film paints a rich portrait of the love affair Cambodians had with rock music during the late 1960s and early 1970s. Viewers come to learn about both the music and the personal lives of some of Cambodia's biggest rock stars from the time, including Sinn Sisamouth, whose talent shines in the archival film clips. Directed by Esy Casey. Produced by Sarah Friedland. 2014. Philippines. 60 minutes. Jeepney gestures toward a number of contemporary issues in the Philippines such as the influence of multi-national corporations, the afterlives and continuances of U.S. imperialism, labor rights, overseas labor, and indigeneity within the Philippine context. Jeepneys are World War II remnants, mass produced and ultimately left behind by the United States. Through the jeepney, which has since become a major form of mass-transportation in the Philippines, the documentary's director Esy Casey threads together a number of stories and voices. 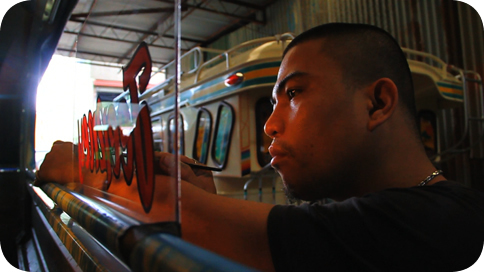 The documentary is attuned to how jeepney art, the wide range of images and crafts that adorn jeepneys, highlights varying social aspirations and different ways of seeing the world. However, the documentary also highlights the struggles of Public Utility Jeepney (PUJ) drivers against prohibitive oil taxes and other government regulations. Overall, Jeepney is a vibrant examination of labor, transportation, and foreign intervention in the Philippine context. The filmmaker is attentive to both the contexts out of which the jeepney is made as well as to their use as spaces for political and cultural expression. Although the jeepney is the film's primary object of interest, Casey more broadly provides viewers a complex, multivalent local history of the unevenness of globalization. Directed by Pelin Esmer. 2005. Turkey. 70 minutes. "To me, life is theatre. Everyone around me plays different roles. In my life, I've played many different roles." These are the opening lines of Pelin Esmer's documentary, The Play, which is set in Arslanköy, a mountainous village in southern Turkey, in 2003. 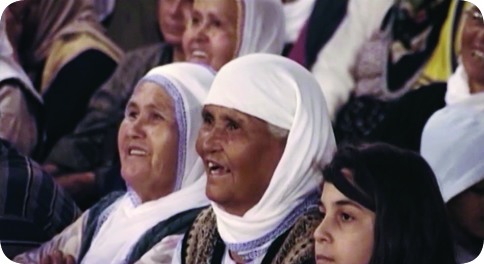 The film tells the story of nine women who form a village community theater group with the assistance of the school principal, Mr. Huseyin, to take on the roles of characters based on their own lives in a play titled "The Outcries of Women," written by Mr. Huseyin. At the outset of the film, the group's lead organizer, Ummuye, describes the work that the women in her village do to provide for their families. They are maids and nannies, housewives and mothers; or they do work also done by men: carrying firewood, and working in the fields or as shepherds. Like the characters of a play, the women in the village play different characters in life. But how will the people of the village receive the play on opening night? How do women negotiate all of these roles publicly? Will participating in the play change how the women view themselves and create better situations for them in their homes and in their daily lives in the village? The film beautifully shows how a creative project can cause a community to reconsider the norms of gender and class relations. "The Outcries of Women" is a composite of the various experiences that the nine women have suffered, and it ends with a message of hope. The drama and tragedy of the women's stories - of walking to a hospital to give birth alone, of not being able to afford needed medicine, of being forced to quit school to marry, of living with an abusive partner - is tempered with humor, banter and quibbles about who should play which role and of the work of memorizing lines and becoming confident on stage.